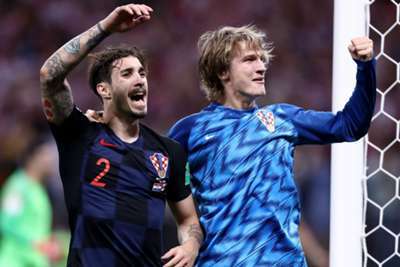 Tin Jedvaj's extraordinary double saw Croatia blow their Nations League pool wide open with a 3-2 win against Spain on Thursday, setting up a make-or-break clash with England. The World Cup finalists endured a miserable start to their Group 4 campaign in League A - thrashed by Spain in the reverse fixture and drawing with England - but they now head to Wembley in contention for a Finals place after an incredible finish in Zagreb. A tame first half was followed by a frantic second as Croatia were twice pegged back by a rampant Spain side, Dani Ceballos levelling after Andrej Kramaric's opener, before a Sergio Ramos penalty cancelled out Jedvaj's first international goal. But the Croatia full-back ensured his side would not be denied, lashing in a rebound in the dying seconds to keep the hosts in the running. Spain, meanwhile, face a nervous wait after completing their group campaign, now requiring a draw between the two teams in London to reach next year's knockout stage. David de Gea was drawn into a smart early stop, helping Ivan Perisic's deceptive low effort onto his right-hand post, but further first-half chances were sparse before Lovre Kalinic tipped away an Isco drive. The first goal was a gift when it finally did arrive. Ramos and Sergi Roberto traded passes in the corner before Perisic intercepted an impudent flick from the latter to send Kramaric through on goal, the forward keeping his cool to finish. Yet Spain suddenly awoke from their slumber and a flowing attacking move down the left concluded with Isco squaring for Real Madrid team-mate Ceballos to slide into the net. Kalinic lost the ball at Iago Aspas' feet for a seemingly simple Spanish second, but the forward prodded against the crossbar and Croatia were able to go up the other end and restore their lead, Jedvaj nodding Luka Modric's teasing cross in at close range. De Gea denied Ante Rebic on the break at one end before a frantic scramble saw Sime Vrsaljko block Alvaro Morata's on-target header at the other, although the right-back's handball allowed Ramos to convert from 12 yards out. However, there was still time for another twist as, with Croatia throwing everyone forward, De Gea could only parry a low shot as far as Jedvaj in a crowded penalty area, allowing the 22-year-old to settle a see-saw contest. Spain looked home and dry after impressive wins against England and Croatia, but subsequent defeats to both sides have left the 2010 world champions at the mercy of their group rivals. England will want revenge against Croatia for the semi-final defeat in Russia, while Zlatko Dalic's men will believe they can produce an unlikely comeback and qualify. The versatile Jedvaj can play anywhere across the back line to good effect, but few would have expected him to make an impact at the other end with two goals. More attacking team-mates squandered chances either side of two assured finishes that made a hero of the young full-back. Spain were torn apart by England last time out and, while Croatia were initially less proficient on the counter, there remain issues at the back. The visitors carelessly handed Croatia the lead, with Ramos shaky once again, and Croatia looked a real threat every time they came forward. Spain face Bosnia-Herzegovina on Sunday in a friendly, but they must first watch England host Croatia earlier in the day. The winners go through, the losers are relegated. Spain, however, will be hoping for a draw. It is still ever so tight.